Deshauna Barber, United States Army Reserve Captain and 2016 Miss USA, will serve as Grand Marshal of this year’s Military Appreciation Days Parade at The Market Common on the Memorial Day weekend. The parade begins at 10:30 a.m., Saturday, May 26, and is a highlight of Myrtle Beach’s Mili...tary Appreciation events during May. The month-long celebration is a “thank you” to our dedicated service men and women, past and present – along with their families – for all that they do on our behalf. As Grand Marshal, Deshauna Barber will lead the Military Appreciation Days parade along Farrow Parkway, then greet fans afterward at the Family Picnic at Valor Memorial Garden. Everyone’s invited to enjoy the festivities, which include military exhibits and live music. The picnic lunch, prepared by the Omar Chefs Shriners, is free for all attendees. As a member of the Army Reserve, Captain Deshauna Barber commands the 988th Quartermaster Detachment Company in Rockville, Maryland. She was commissioned as a Quartermaster Officer in 2011, and has been serving her country in the Army Reserve ever since. Using her educational background in technology, Captain Deshauna Barber also has worked as an IT Analyst for the United States Government for more than five years, employed by such agencies as the US Department of Defense, the US Navy, the US Department of Transportation and the US Department of Commerce. Deshauna Barber, now 27, was born in Columbus, Georgia. As the daughter of an Army Master Sergeant who served in the United States Special Forces, Barber relocated numerous times during her childhood. She attended Virginia State University and earned a Bachelor of Science degree in Business Management. Barber continued her education at the University of Maryland University, earning a Master of Science degree in Computer Information Systems and Services. In December 2015, Deshauna Barber won the Miss District of Columbia USA title. And, on June 5, 2016, in Las Vegas, Deshauna Barber won the coveted Miss USA crown and sash. 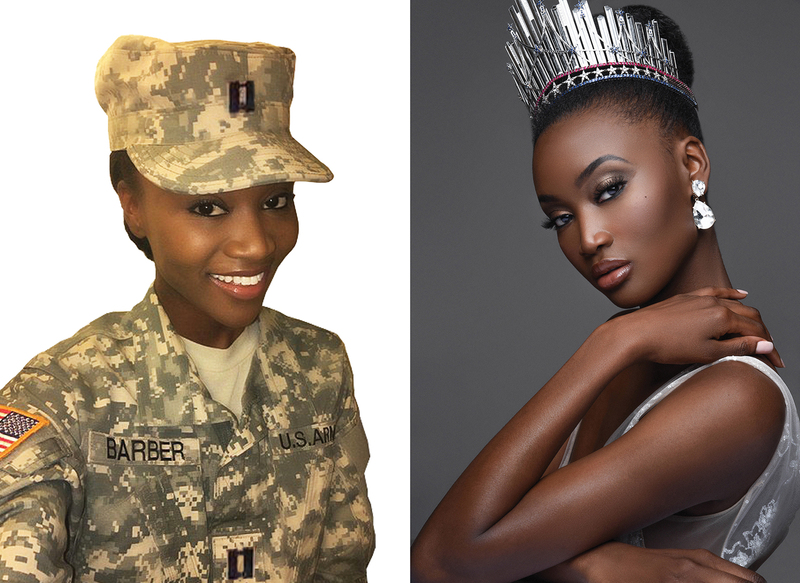 Barber is the first active member of the military to win the Miss USA crown. She went on to compete in the Miss Universe 2016 pageant in the Philippines, where she placed in the Top Nine. Deshauna spent her year-long reign as Miss USA by devoting her energy to community service. She offered her voice to various charitable organizations, including the USO, Smile Train, Best Buddies, Operation Homefront and more. Her print, television and XM radio appearances include Good Morning America, The Steve Harvey Show, The Rachael Ray Show, Fox and Friends, The Chelsea Show, Good Morning Washington, The Ellen DeGeneres Show, The T.D. Jakes Show, The Nightly Show, The Daily Show, Live with Kelly, Lunch Break, Glamour Magazine, Diversity Magazine and The Source on Sirius XM. In her personal time, Deshauna Barber is an advocate and public speaker. Her passion for our men and women in uniform motivates her to serve as an advocate on behalf of soldiers suffering from Post-Traumatic Stress Disorder (PTSD). A survivor of child sexual abuse and extreme bullying, she also serves as an advocate on behalf of youth and survivors, passing on a message of perseverance. Deshauna works to spread her encouragement and strength to others. In addition to the big parade and picnic, other activities during Military Appreciation Days include the third annual Horry County Junior ROTC Drill Meet at the Myrtle Beach Pelicans’ Stadium and the traditional Memorial Day ceremony on the Myrtle Beach Convention Center Plaza. Many Myrtle Beach area attractions, accommodations and restaurants offer military and veteran discounts during the month of May and year-round. Myrtle Beach Military Appreciation Days are sponsored by the City of Myrtle Beach, the Myrtle Beach Area Chamber of Commerce and PGBA, LLC.